How much does it cost to travel to Prince Edward Island? How much money will you need in Prince Edward Island? CA$162 ($121) is the average daily price for traveling in Prince Edward Island. The average price of food for one day is CA$40 ($29). The average price of a hotel for a couple is CA$186 ($139). Additional pricing is in the table below. These average travel prices have been collected from other travelers to help you plan your own travel budget. How expensive is Prince Edward Island? Known as simply "PEI" or "the island," Prince Edward Island is full of spectacularly red sandy beaches and dunes. The high levels of iron in the soil of this Canadian destination give the shores their rusty, prominent color. As the locals so cleverly out it, "there are no white dogs in PEI." Prince Edward Island is Canada's only island province, and is also the setting to Lucy Montgomery's classic novel Anne of Green Gables. As an island, this area isn't always easily accessible by car. To drive to Prince Edward Island, you'll have to use the iconic Confederation Bridge that crosses the Northumberland Strait between New Brunswick and PEI. This short, ten-minute drive can be a fun event on its own  complete with scenic viewing stations on the New Brunswick side. There is a hefty toll to pay when returning to the mainland. There are several express shuttles or car ferries available, as well. The most unique sights on Prince Edward Island are related to the beaches of the province. To see those scenes you thought only existed on postcards, visit Malpeque Harbour. This Prince County bay is home to famous oysters, picture perfect fishing boats and colorful boathouses that resemble miniature barns. High Bank's views are a bit more dramatic. 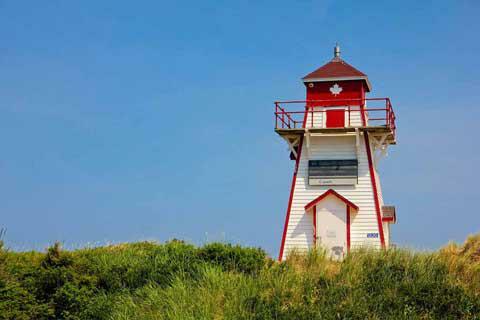 The cliffs surrounding this Kings County attraction, give visitors stunning views along the Northumberland Strait of Nova Scotia and Pictou Island. If it's a sight from another world you're interested in, visit the Northumberland Strait. Legend says that long ago a ship was seen on fire in this waterway. While many ships sailed out on rescue missions, the closer they got the, the more the ship receded from view. Locals all across Prince Edward Island will swear they have seen The Ghost Ship of the Northumberland Strait. What better place to see the Anne of Green Gables musical than in the home of the story itself? Visit the Confederation Centre of the Arts in Charlottetown. Every summer this theatre has productions of the musical. After the show, visit the theatre's small art gallery and public library. Prince Edward Island bike tours begin in Cape North and make their way through Malpeque Bay, along the Bay of St. Lawrence, to the eastern most point of the island. As you glide along, you'll find yourself surrounded by fishing villages like Cavendish, North Rustico and Stanhope. For an all-inclusive, outdoor hot stop, visit Victoria Park in Charlottetown's west end. Within this area are several recreational and historic sites. The baseball fields, tennis courts, skate park and pool give visitors a wide variety of choices on a sunny day. There is a playground for the little ones, and two historical sites. Fort Edward is an old British fort meant to protect the Charlottetown harbor. Fanningbank, the residence of Lieutenant Governor of Prince Edward Island, is on the east end of the park. For a laid back experience, consider just taking a few scenic drives around the island. Get lost along the back roads and highways. While it is highly encouraged to explore and get lost, there are three, established routes  North Cape Coastal, Blue Heron and Point East Coastal. Each is a unique and special path to wander. In the past few years, Prince Edward Island has experienced a big improvement in the quality of its restaurants. Thanks to the changing landscape of travelers, the island has expanded its cuisine options. The traditional, lobster-serving, coastal spots are still around, and should be visited, but if you're looking for a more sophisticated or international meal, there are several additional options. Once you arrive on Prince Edward Island, there are several options for getting around. Non-metered taxis are available within Charlottetown and Summerside, This is a convenient way, but can be rather costly. Charlottetown has a public transit system. With a cost of just $2, this is the more cost-efficient way to travel between various locations within the city. If you don't plan to leave the town, this is a fast and reliable system. In the summer months, cycling is very popular among locals. There aren't necessarily specific bike paths on the roads, but drivers tend to be very courteous to cyclists.